I love a good Tag, so when Sarah at Seriously Shallow tagged me, I obviously felt the need to join in. Would you rather lose all of your mascaras, eyeliners, lipsticks and lip gloss or lose all of your palettes and eyeshadows? Easy peasy, mascaras, eyeliners, lipsticks and glosses can wing there way to a bottomless pit. I don’t wear expensive mascara as it has to be replaced so regularly and I have never found any high end lipsticks that delivered better than high-street so my money always goes on eye-makeup. I could NEVER chop off all my hair, I have the worlds worst shaped head and face, so it is really not an option for me. I even look weird in a ponytail. Would you rather have coral cheeks or pink cheeks? Coral, Every time. I have some pink blushers for the depths of winter, but it’s not my go-to shade. If you had £1000 to spend would you rather buy clothes or make up? Clothes, as cheap make up can look really good with clever application, the same can’t be said for clothes. I would buy a few investment pieces to make my wardrobe more polished. Would you rather apply lipstick as eyeliner or eyeliner as lipstick? Who came up with these questions? Why would I do either? It would have to be eyeliner as lipstick, but it wouldn’t be my everyday eyeliner as I don’t think I can style out dark lips. 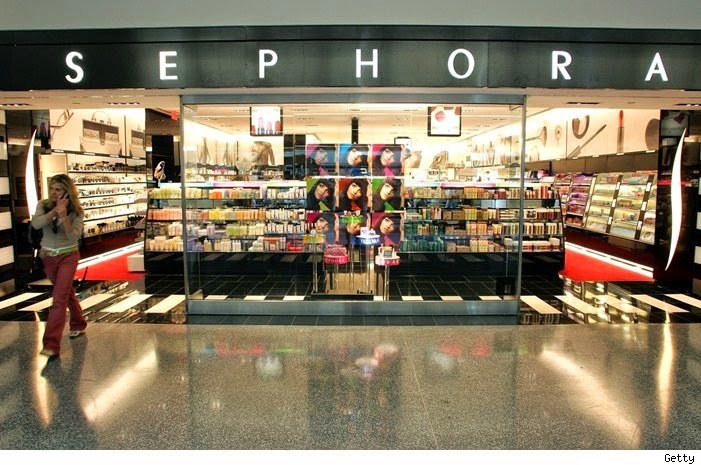 Sephora, the holy grail of beauty stores. I like MAC, don’t get me wrong, but Sephora has so much more choice. Would you rather use one eyeshadow colour or one lip colour for the rest of your life? One lip colour, definitely. I can never find decent lipsticks/glosses etc.. anyway. I know what colour I want but I can never find it, so I regularly have a pretty low key lip colour, I think I look dreadful in brights. I hate the feeling of wearing more clothes than needed, you will often find me in flip-flops in Autumn and other improbable combinations due to my hatred of having too much on. When I was a kid I would do most anything to not have to wear a coat and cardigans wear the devil invention. So I would definitely say Summer clothes in Winter, as I’m Northern and therefore used to going out in a mini dress while it’s snowing. Darkety Dark Dark. I love Chanel Rouge Noir, still after at least 10 years, it’s my favourite nail colour. Would you rather give up your favourite lip colour or your favourite eye product? Favourite Lip Product, as I mentioned I am never 100% happy with lip products anyway. Would you rather only be able to wear your hair in a pony or a messy bun? Messy BUN! I look heinous in a ponytail. Even to go to Zumba I wear a slightly scruffy pony tail as I look very interesting in a slicked back ponytail. Never use lip gloss, I love being able to paint my nails, I would do it more often if the removal of said polish didn’t damage my nails so much. Would you rather shave your eyebrows and have none at all or sharpie them in every day? Nail Polish. I am a serious makeup addict. I do go out without make up (well okay with just mascara) but not often and mainly on holiday. Well that was bizarre, I hope I never have to make most of these makeup decisions in real life.